I was invited to come to Africa via a dear friend and pioneer missionary, Liz Adleta. Liz and I have been partnering for over a year raising-up prayer for unreached people groups through an initiative called Inherit the Nations. I came with the hope of sharing about 10 Days in Africa but more than that, I just sensed a strong “yes” in my Spirit to take this trip. I was able to share about 10 Days in several group settings and once with about 100 people. Later, I was able to have great follow-up conversations and start new friendships. I hope the Lord will use this trip to grow 10 Days in African soil! However, the larger theme of the time for me was simply to love whoever I came in contact with and to serve however I was needed. Logistical challenges were a major feature of the trip! One morning on the bus, one of the western missionaries encouraged us all to be FAT in the face of these challenges, which stands for "flexible, adaptable, and teachable." I soon got to put FAT to work by saying "yes" to a number of unexpected ways to serve. For instance, before the conference started, I learned that I was part of the prayer team (good to know--and I like to pray!). The morning the conference started, I discovered on the bus ride in that I would be on the worship team. Once they found out I could play drums, I was asked to play djembe for a room full of African nationals. I was a bit intimidated at first (Africans are known for their drumming) but really enjoyed getting to help lead worship on a continent of worshipers. 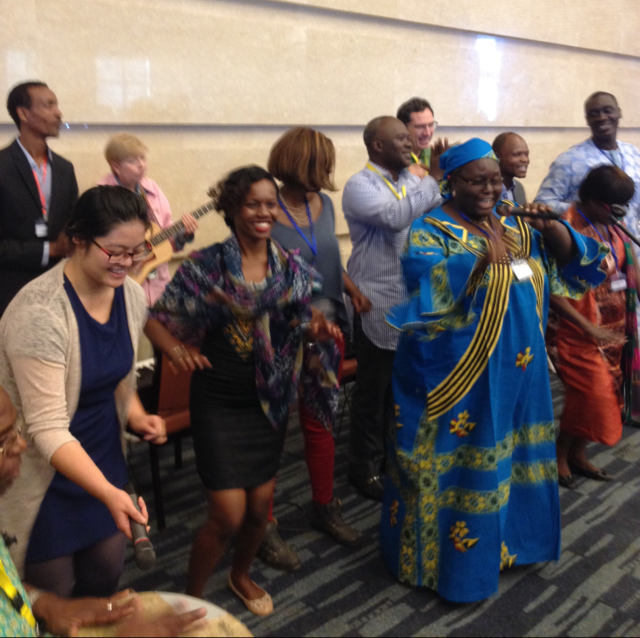 I was especially touched as we did some native African songs and I saw Africans dancing to the beat of my drum. I tried to walk the line between staying cheerful and accepting when things didn’t go as planned and then taking initiative to help when I saw a need. I found myself stepping into many other unexpected roles as the week went on, like sound-guy, microphone guy, fixer of broken objects, and errand runner (to name a few). It was a fun to be able to help and serve in so many unexpected ways. My biggest take-aways from the trip related to the African people and to America. I absolutely love the African people. There’s a refreshing openness about them and I found it easy to laugh with and love these people. I felt like I just fit-in. I loved discovering so many new things about their diverse nations and cultures and was delighted to upend a few stereotypes about Americans. I was able to hear first-hand testimonies from believers undergoing persecution from their governments in Northern Africa. I enjoyed hearing their views on their own governments, how different Africans perceive one another, and their views on America. Also, it was interesting to me that many of the racial tensions we’re experiencing in America were not currently hot-button issues in most of Africa. In fact, a number of them were puzzled by what's happening in America. Speaking of America, I came away with a better perspective and appreciation for my nation than I’ve had before. Part of the reason this joke exists is that we only need one—because north of Mexico, we’re on a continent of primarily English speakers. What a contrast to Africa, where there are 56 different nations on one continent and thousands of native languages. I realized more deeply how good a system of government we have. I heard first hand reports about African nations that are incredibly corrupt, or run primarily for the benefit of a ruling elite. Others are better run, but still face incredible financial deficits and problems. Seeing that helped to put American politics in perspective. Most of all, I was humbled to hear Africans urging other Africans to pray for America. One brother urged prayer for us “because as America goes, so goes the world.” We are far from perfect as a nation, but all in all, I came back more grateful for my homeland and stirred to join my African brothers and sisters in prayer for our nation. Speaking of stirring up prayer in America, click below for more information on the upcoming Denver Summit, May 12-15 Co-hosted by 1 Church Initiative, 10 Days, and the Denver 10 Days Together network this will be an incredible time of fellowship, encouragement, and envisioning for those passionate about uniting the Body of Christ in their cities. I hope you can join us in Denver!